Createspace Independent Publishing Platform, 9781500916459, 380pp. When I was six years old, my father killed my mother. He beat and choked her to death. I'm told that he was found hanging from a homemade noose in his cell. I want to know why he waited so long to do it. Sydney Brennan isn't sure how to answer her client's question, short of holding a's ance, and the Tallahassee detective has some questions of her own. Why does Noel Thomas remember so little about her childhood? Why is she delving into her father's suicide now? And, most importantly, why isn't Noel telling her the truth? Sydney crisscrosses the Florida Panhandle, reconstructing the tragic Thomas family history. The violence that destroyed the Thomas family connects to a present-day web of deceit and corruption through a desperate man willing to do anything to keep his secrets safe. 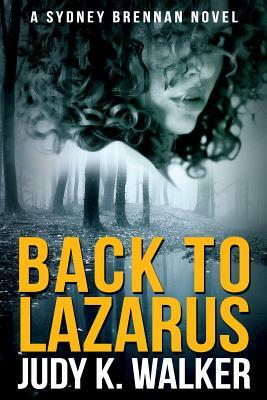 To discover his identity, Sydney must go Back to Lazarus, back to the town where Noel's beautiful but troubled mother began her inevitable descent over twenty years ago. But by following in the footsteps of the murdered woman, does Sydney risk sharing her fate? Rooted in bars and back roads and Panhandle prisons, forgotten towns and forgotten people, at its heart Back to Lazarus is about stories: the stories people tell us, the stories we tell ourselves, and what happens when we realize it's all a lie.